HGA has won two Sustainable Innovation Merit Awards for East Los Angeles College Language Arts and Humanities Building at the Annual U.S. Green Building Council-L.A. Chapter Green Gala. HGA won for sustainable design strategies in Water Efficiency and Energy & Atmosphere. 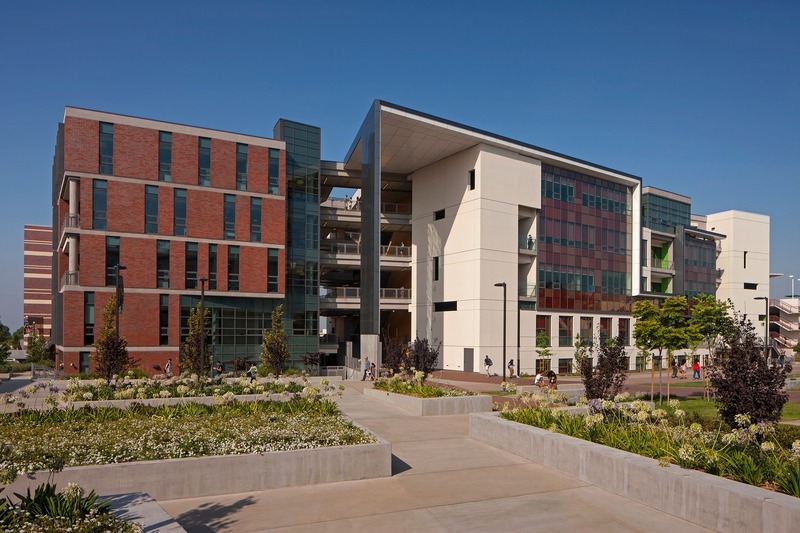 Completed in 2016, the Language Art and Humanities Building, which consolidates nine departments into a flexible learning environment, integrates three guiding principles to meet the campus’s vison for sustainability: create a great human experience for learning, meet target performance, and create financial value for the client. Energy-efficient systems include rainwater collection tank for landscape irrigation, low-flow water fixtures, construction waste diversion, recycled construction content and regional materials, renewable energy from campus photovoltaic system, solar shading panels, natural ventilation, energy monitoring system, and automatic sensors and controls connected to operable windows and chilled-beam cooling system. The 7th annual awards acknowledge sustainable design innovation from individuals and built projects representing government, real-estate owners, developers, architects, engineers, contractors, and LEED specialists.